Sometimes all you need in life is a simple, delicious kale salad. Kale is one of those things that I eat a ton of but rarely feature on the blog. Aside from a couple of salads here and there, I’m usually posting decadent things like this, this, and this! Maybe it’s because kale has been done so many times, maybe because it’s just not usually that exciting. Either way, that ends today! And this salad is very exciting. It’s probably the best kale salad I’ve ever tried! It’s also super easy to make with only 6 ingredients plus salt and pepper. Actually, we can thank my sister and my mom’s boyfriend for this incredible recipe. My sister made it for me on a recent trip to Atlanta and I fell in love. I used fresh kale grown right in my backyard for this salad! How exciting is that? If you’ve never tried your hand at gardening, I highly recommend it. A patch of sun, a bit of soil, an automatic timer for watering and you are good to go! The secret to this amazing kale salad is how finely the leaves are chopped. Some kale salads are just so damn chewy. I’m not trying to work that hard when I’m eating, please believe! You want the consistency to be a bit larger than how fine you’d chop parsley for tabouli, but not by much. That’s the most time consuming part of making this kale salad. The rest is a snap! Mixed with toasted pine nuts, dried cranberries, vegan parmesan, this kale salad is a winner! It’s tossed with lemon juice and olive oil to let the flavors shine through. Throw in a pinch of red pepper flakes if you like heat and be sure to make a giant batch, you’ll definitely want seconds! 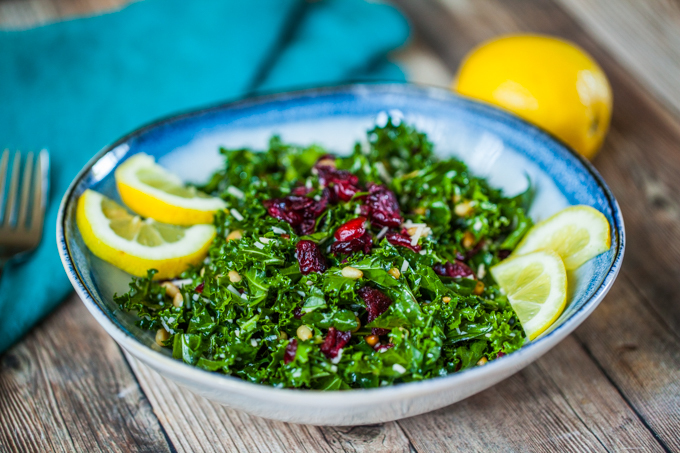 If you try this cranberry kale salad recipe, be sure to rate it in the comments below and tag a photo #carrotsandflowers on Instagram! We love to see what you make! I’m also hosting an Instagram feature competition to celebrate reaching 20,000 followers! If you’d like to join, recreate one of my recipes, share one of my photos or videos, or create your own vegan version of a traditionally non-vegan recipe. I’ll be sharing my favorite accounts to our followers. I can’t wait to see what you come up with! The world's best kale salad! Crunchy, simple, and full of flavor! Finely diced fresh kale with toasted pine nuts, dried cranberries, and vegan parmesan shreds in a light lemon dressing. Dice the kale SUPER fine, not quite to the consistency of parsley in tabouli but pretty close. It's part of what makes this salad so don't skip this step! Toast the pine nuts in a skillet over medium low heat. Stir them constantly so they don't burn. Chop the cranberries fine, as well as the vegan parmesan. Combine all ingredients in a large bowl and mix well with your hands, massaging the oil and lemon juice into the kale. Add salt to taste and a pinch of red pepper flakes. Give the salad a good stir and enjoy!